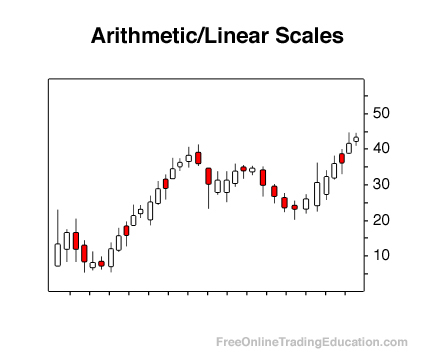 Also known as a linear price scale, an Arithmetic Linear Price Scale will have equally spaced price values. Unlike logarithmic scaling, each change in price has the same vertical distance on a chart regardless of price level. A Linear chart does not take into account that a point value move is typically more significant on a lower priced stock than a higher priced one. Background: Linear scaling is mainly used in short-term trading and is often used by traders of commodity futures. Practical Use: Identifying whether or not a chart is Linear is as simple as viewing the vertical price scale on a chart. The price scale up the side of an Arithmetic/Linear chart is evenly spaced.